It’s time to start packing away those heavy coats, ski boots, snow shovels and other tools that you rarely need outside of winter. Instead of packing them in your garage or a backyard shed, try a portable storage solution like Zippy Shell. You simply pack up your winter items and they’re relocated with ease to a central storage area. If there’s a last minute snow storm, you can always drop by and pick up anything you need without having to keep it at home and contribute to clutter. Need to do some serious deep cleaning such as resealing wood floors or steam cleaning carpets? Try moving your most delicate items or furniture prone to damage out of the house and into a portable storage unit. Since the storage space is sitting in your driveway or yard instead of down the road, it’s a quick process to get everything in and out. You may even feel inspired to put a fresh coat of paint on the walls while the room is empty and clean. Before getting on your hands and knees to scrub the bathroom tile, make sure you’ve reduced unnecessary clutter in each room. Invest in storage containers to take advantage of space under stairs, under beds and in basements or attics to increase your living space and to make it easier to keep your home clean. 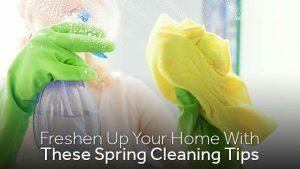 Instead of setting aside an entire weekend and trying to marathon clean for 12 hours at a time, break the tasks down by room or by the type of chore. For example, you could spend two hours a day on the tile floors throughout the home or a task like cleaning the windows. If you want to make a significant impact, make sure to limit your cleaning sprints to no more than a few hours at a time and take breaks in between. 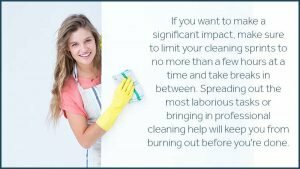 Spreading out the most laborious tasks or bringing in professional cleaning help will keep you from burning out before you’re done. Feeling a little cluttered by too many remnants of the winter holidays and seasonal fun? Get in touch with us here at Zippy Shell Greater Columbus to find out exactly how to best store your gear, whether you need to move it permanently for long-term storage or just for now so you can clean up around it.